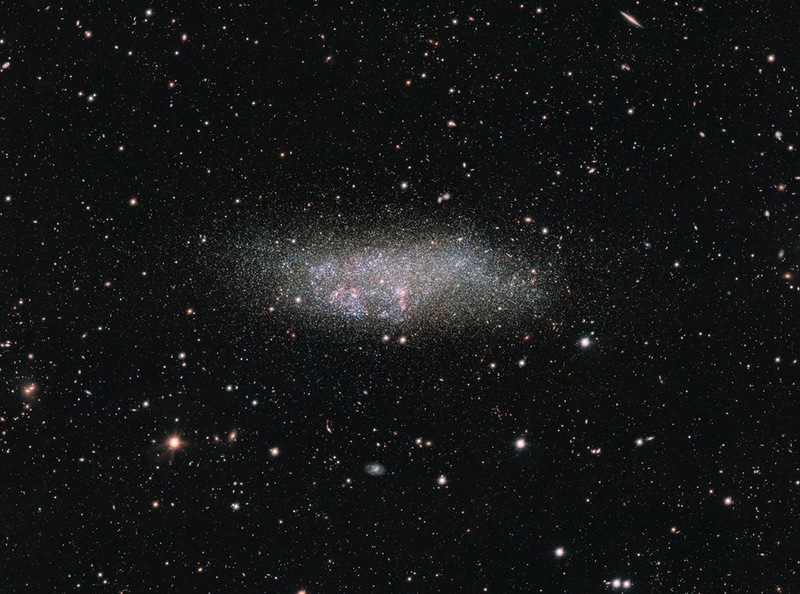 Explanation: Named for the three astronomers instrumental in its discovery and identification, Wolf - Lundmark - Melotte (WLM) is a lonely dwarf galaxy. Seen toward the mostly southern constellation Cetus, about 3 million light-years from the Milky Way, it is one of the most remote members of our local galaxy group. In fact, it may never have interacted with any other local group galaxy. Still, telltale pinkish star forming regions and hot, young, bluish stars speckle the isolated island universe. Older, cool yellowish stars fade into the small galaxy's halo, extending about 8,000 light-years across. This sharp portrait of WLM was captured by the 268-megapixel OmegaCAM widefield imager and survey telescope at ESO's Paranal Observatory.